French fries. Brown gravy. 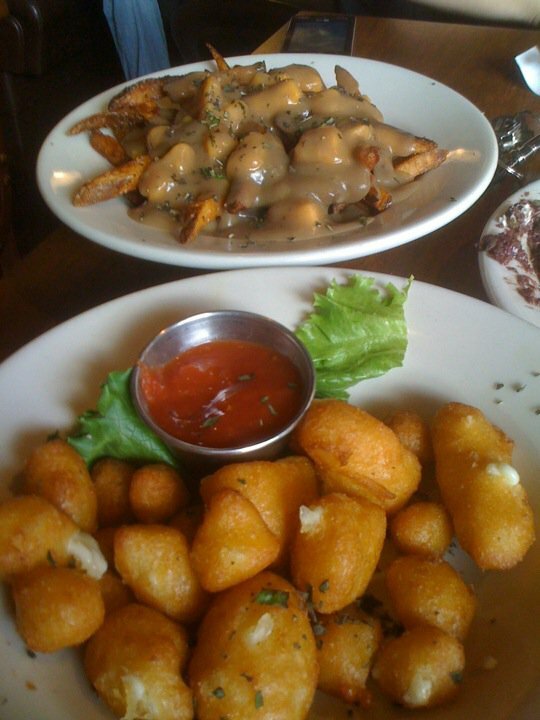 Cheese curds. Simply amazing if you ask me. I grew up in Canada eating this carb-tastic creation and was shocked that it was nowhere to be found when I moved to the USA in the early 1990’s. My new stateside friends gawked at the sight of me dipping my fries in brown gravy so I knew that had no clue what poutine was. Poo what? Was their response. Yeah, they had no idea what they were missing out on. I’m happy to report that this dish now popping up in more and more restaurants menus around town. I’ve had good, bad and so-so ones but so far the best I’ve had in Portland is at the Hawthorne Hophouse. The bonus is their gravy is vegetarian and it tastes so good that the carnivores won’t even notice. They hand cut their fries and top them with a generous portion of curds and gravy. 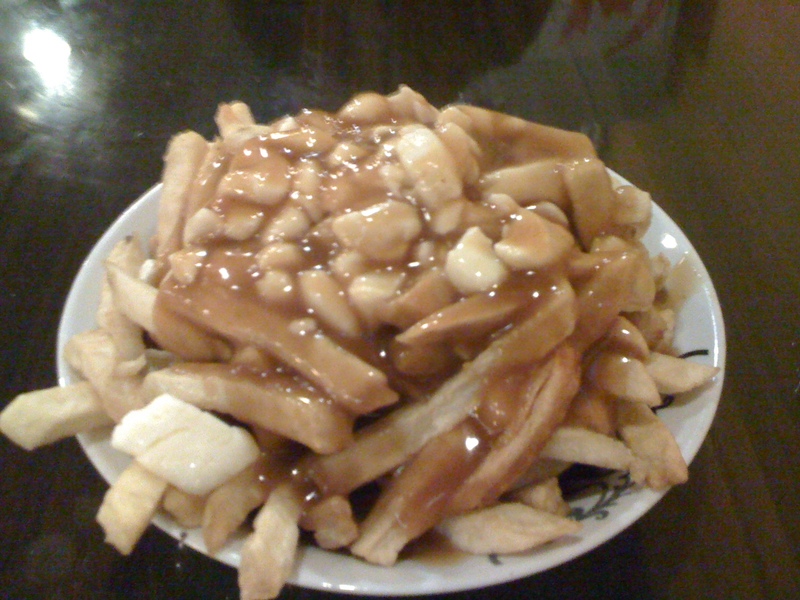 This is what real poutine should look! 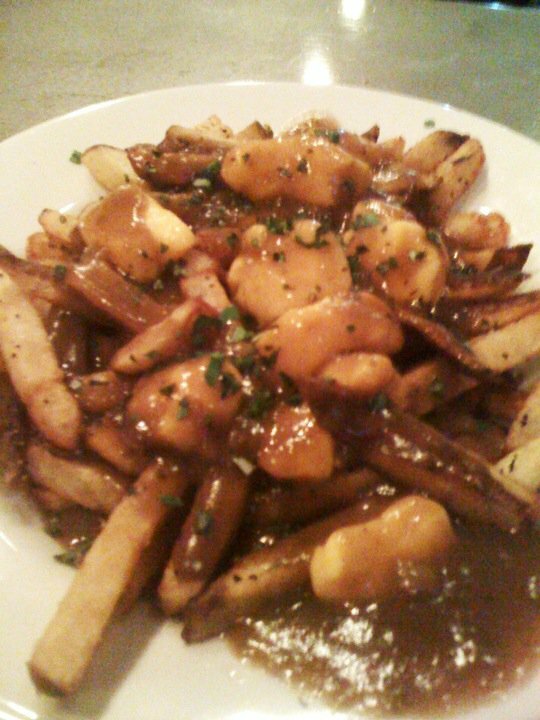 Poutine: pronounced “poo-teen” is comfort food to me. The mastermind to this heart attack on a plate is some crazy Canadian. Go figure. I should both thank and curse the creator for making such a fattening meal. Most of my American friends have no idea what this dish is and most have gawked at the idea until they have tried it. The traditional variety consists of french fries topped with cheese curds (squeaky cheese!) and then smothered with brown gravy. Unfortunately, it isn’t a common menu item in Portland yet. The places that do sell it don’t quite do it justice. I didn’t realize how easy it was to screw up this dish but some places have managed to do so. How you might ask? It’s only 3 ingredients but by choosing the wrong cut of fries (no shoestrings! ), using small chards of curds (you need big chunks!) and bad tasting gravy (it happens), one can easily disappoint any Canadian that knows how it should look and taste. So if you want good poutine, I must refer you to go just about anywhere in Canada. Even the drive thru A&W’s will make it better than most places in the States. When I’m in Vancouver, my poutine fix is satisfied by a trip to Belgian Fries on Commercial Drive. They make a terrific vegetarian gravy that doesn’t have a weird aftertaste like the one served at Potato Champion here in Portland. I don’t encourage eating this often but every once in a while it is good eats.